Don’t do anything new on race day! That’s the first answer that typically follows any question about fueling for a race, right? There are pitfalls (not to mention porto-johns) that await you if you neglect this little golden nugget of conventional wisdom. Sure, toward the end of a race, you may need to eschew all kinds of traditional thoughts on the matter and just throw random calories at the problem if you find your body in serious need. But, if you’ve prepared properly, then you’re hammering your way toward victory lane with your favorite gel, chew, waffle, beverage, whatever, in your mouthparts. Following my own advice, I decided to use one BLISTERING day in Phoenix to try something new before an upcoming race. Temps had hit 115 degrees for a few days in a row, and I needed to get my last strength interval session in before the Missoula Marathon. So, I gritted my teeth, bought a month-to-month gym membership (not joking!) and proceeded to step onto a treadmill for a 2 x 5mi. interval session. I would put in 15 total miles, listen to a couple hours of music from my “I Hate Treadmills” playlist, and inhale what I think was smoke coming off the motor of this hideous machine before I got out of there! The beauty of it was… I had a way to distract myself from all of it! My go-to fuel over the past few months has been the Pink Lemonade Honey Stinger Chews. But, as is evidenced by my distain for treadmills, I don’t do so well with stagnation or monotony for very long. So, I decided to give something else a try! 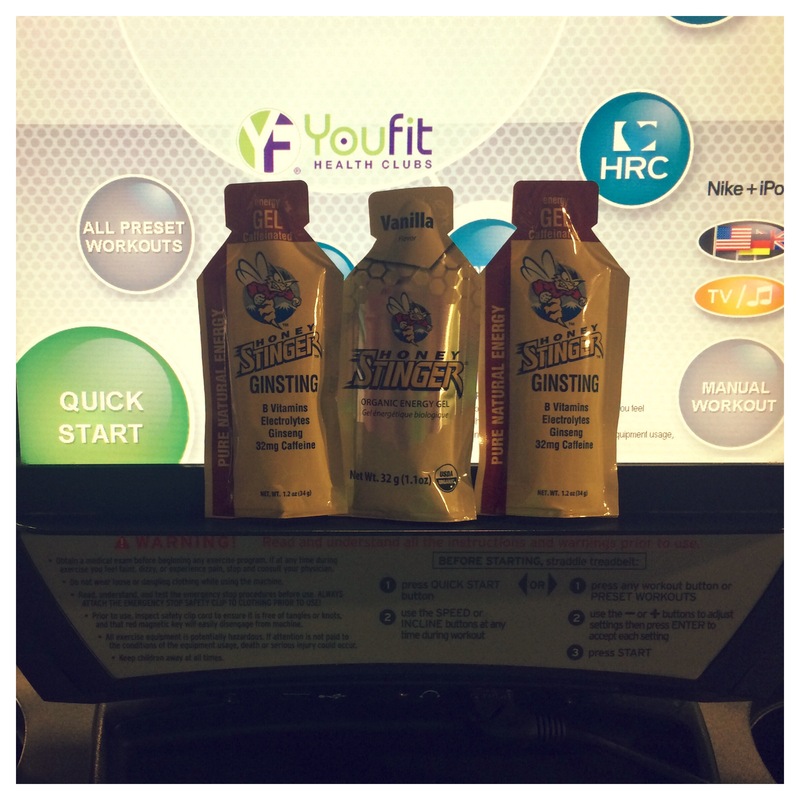 I would hit my stride and try out the Honey Stinger Ginsting and Vanilla Gels. Controlled environment, known workout specifics, dreadmill negativity combated by conscious new fuel scrutiny? It was a great combo! I started with the Vanilla gel during my warm up miles and then started my first 5 mile effort. I wanted to try to caffeinated burst from the Ginsting gels later in the workout just in case they happened to cause any stomach issues. Good results on the first interval from the Vanilla, and then I hit the first Ginsting gel at the beginning of my mid-run rest mile. Soon after that, I was off on my next 5 mile effort and really pushing. I had a lot of energy and was able to push hard during the final couple of miles! I took one final Ginsting gel right at the end of the workout so that I could evaluate the longer effects of the gels in my system. They worked really well for me, and I was really glad I had put in a little research prior to my race. Options are always good! This entry was posted in Uncategorized and tagged interval session, treadmill workouts. Bookmark the permalink.